The third Monday in January is the day Americans honor the efforts of Martin Luther King, Jr. More than a celebration of the man and his life, this day is set aside to remember the stalwart strength and dedication to the cause of justice that all those who fought (and continue to fight) for equality and human rights around the world. This January, celebrate civil rights with a flower that represents the valor and bravery needed to stand tall in a time of challenge and controversy- statice. Understated, but amazingly long-lived, this flower is the perfect pick for holiday that it more than just a day off work. It’s a day to continue the work, started long ago, towards a more free and just society. Statice, sometimes called sea-lavender, grows wild along rocky shorelines of temperate climates and has a certain ruggedness and strength that counterbalances a delicate beauty. The blooms are one of the truest purples found in the floral world and range from a deep aubergine to a pale lavender. The branching stems of statice are topped by a cluster of papery-feeling, colorful bracts that each contain an inner flower. 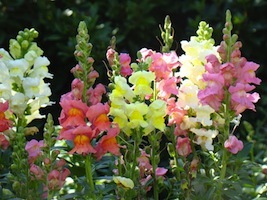 Appearing almost flattened, the flowers group together in bunches 3 to 5 inches long that last for weeks. The stems have a papery quality as well, perfectly straight and feeling almost like a wire covered with green ribbon. They are hardy and strong and travel well. Static is a popular flower in floral arrangements, both for its color and shape, and can be found year round as an addition to bouquets. Prized for its longevity, the stems of statice will outlive almost any other bloom and remain colorful for more than a month- even longer once it is allowed to dry. This ability to outlast other fragile flowers gives statice a reputation for tenacity and strength. In the Victorian language of flowers, it is said to symbolize dauntlessness. 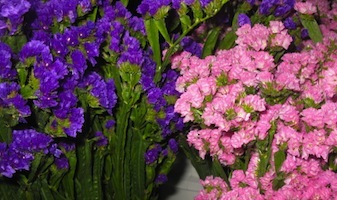 While generally paired with other showy flowers such as roses or lilies, statice can hold its own in a vase. While traditionally purple, there are new cultivars that come in yellow and pink and new varieties that are both purple and white. Rather than using it as a filler flower along with other blooms, try gathering stems of several different shades of statice and trimming them rather short in a round vase. The spectrum of color is pretty spectacular and will remind one that all shades are beautiful.